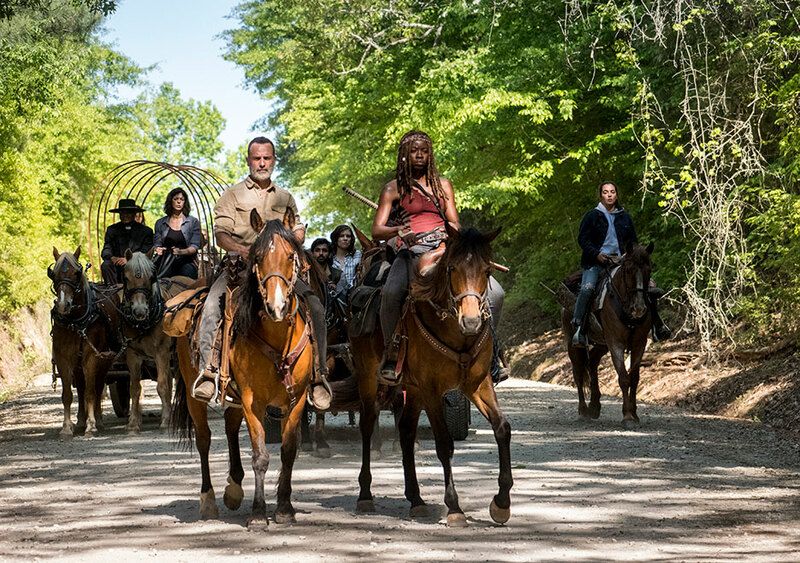 The Walking Dead prepares for major changes with the upcoming Season 9 as new characters arrive, firmly established characters leave… and there’s also horseback rides involved! The Season 9 Preview Special was hosted by Yvette Nicole Brown, as Chris Hardwick was temporarily replaced while having his personal life investigated by AMC. Consider this the #MeToo episode of Talking Dead. The following week, Chris Hardwick made an emotional return after the mid season premiere of Fear The Walking Dead, basically spilling his guts to the audience. It seemed very heartfelt. Back to next year’s TWD: Showrunner Angela Kang was joined by Jesus (Tom Payne) and a king (Khary Payton). They discussed the growing relationship between King Ezekiel and Carol, that Maggie’s baby will be named after her dad (Hershel), Jesus and his failed attempt to reach out to Morgan (before the character left for Fear the Walking Dead), Ezekiel’s father-son relationship with Henry, that Rick and Michonne’s relationship is one of the strongest on the show (especially while raising Judith), the possible direction for Michonne’s character (hint: it’s not what you expect) and the tension between Maggie and Rick from last season that came from butting heads about Negan’s life. Next year, the relationship between Rick and Daryl will significantly change, while Daryl will now have a more mature and more harsh voice. There will be new characters arriving who are based on the comics, including Alpha (Samantha Morton), Magna (Nadia Hilker), Yumiko (Eleanor Matsuura), Connie (Lauren Ridloff, who’s the show’s first deaf character) and her sister, Kelly (Angel Theory also has hearing loss and also knows ASL). Each one will bring something new to the show, including some international flair, as actors hailing from Germany and the UK will be joining next season. But most of all, we’re really looking forward to seeing Dan Fogler on the show and learning about his character, Luke. Also, there will be a year-and-a-half time jump to next season. So, there’s that. There’s lots of changes in store, that’s for sure. Granted, YNB did an OK job as this was her first attempt at hosting the talk show, so she was probably really nervous. But as a host, her very quick talking and answering her own questions (and even more annoyingly, finishing other people’s thoughts) just got out of hand at times. The good news is that Hardwick’s back for Fear and TWD after shows. The bad news: She was actually chosen to replace him, should he be permanently fired. That would not have gone well at all. I wonder how long she would have lasted as the face of the franchise’s fans? Sure, the hype is real and the sole purpose for this episode is trying to raise awareness and excitement for The Walking Dead, which won’t air until Sunday, October 7, 2018. I’d say it was definitely filmed a little early, but since AMC already cancelled Talking with Chris Hardwick, you can surely expect plenty of reruns throughout the summer in case you missed the episode.